Tales of light, shadow, shape and imagination. 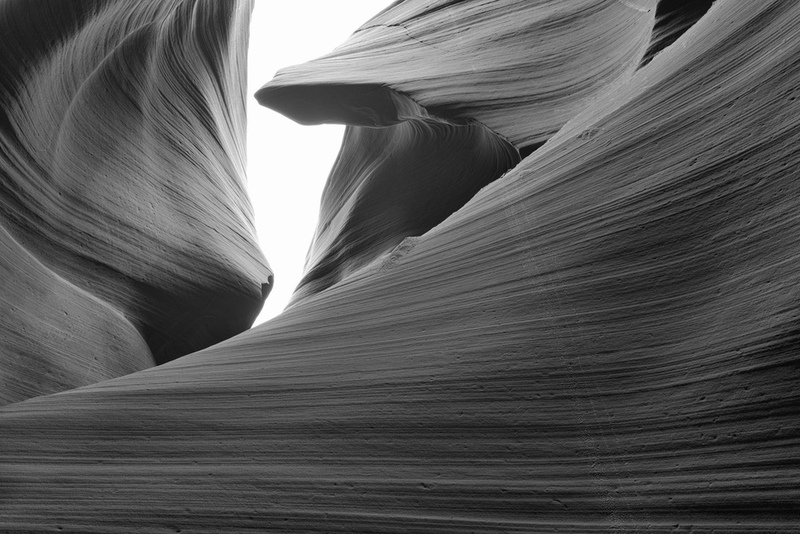 Lower Antelope Canyon in Black and White. The place was discovered in 1931 by a young Navajo girl. It has become popular in the past decade thanks to a number of photographers who took stunning images of the place. The photographs shared online became quite popular and soon everyone knew about the canyon. I don’t know about Upper Canyon but Lower Antelope Canyon is so popular that the Navajo family who owns the original Lower Antelope Canyon tour company has decided recently to create a second one to be able to deal with the influx of tourists from around the world. I visited Antelope Canyon back in May 2015. The place is indeed magnificent, thanks to its shape, texture, light and color. As a photographer, I always challenge myself to see the world around me from a different perspective than everyone else. 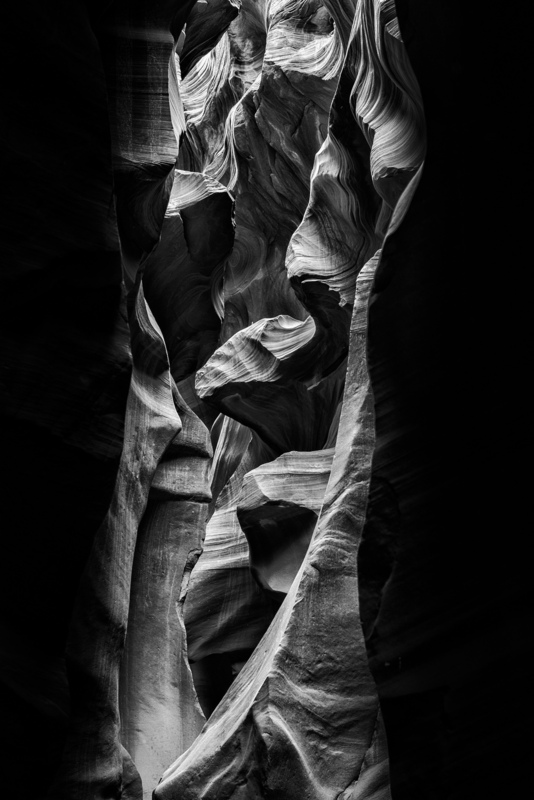 I looked at the photographs I took at the canyon after getting home I tried to dissect what makes Antelope Canyon special. It obviously was the color that makes the place special but I believed there was something more to it, not just the color. I thought to myself: “What if I get rid of the color from the photographs?”. 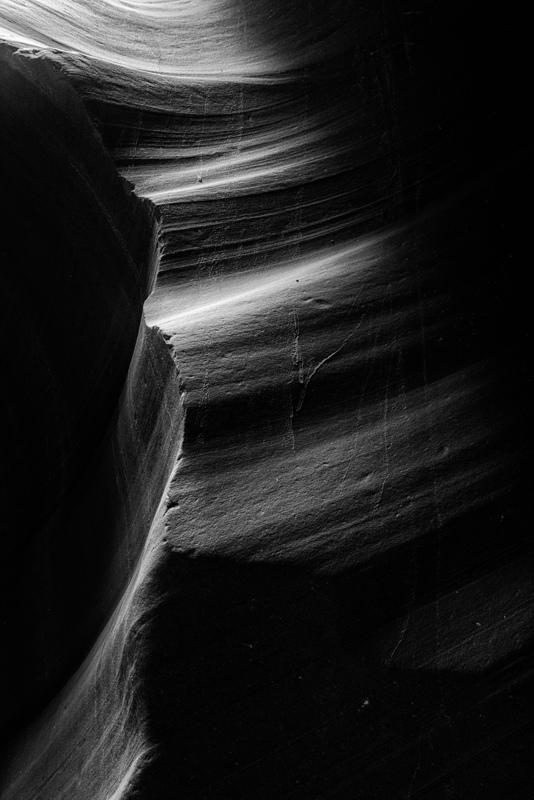 I edited the first photograph in black and white and it occurred that to me, Antelope Canyon is special, not because of the color, but because of how the light is projected inside the canyon and on the walls, how shadow helps in creating the shapes and how both the light and shadow can stimulate our imagination. Once you have imagination, you can create your own tales; tales of light, shadow and shape.